Help to keep vinyl in place when installing, Suit for carbon fiber vinyl film, window films, PVC film, and all other Car wrap vinyl film. Holds signs, films and wrap in the correct position without slippage, marking or damage to signs, vinyl or vehicle paintwork. Also suitable for other holding applications when in contact with steel surfaces. Each Sign Gripper contains 6 powerful neodymium magnets in an alternating polarity array embedded within a slip resistant, scratch resistant coating making them the ideal solution for securely holding vinyl signs and wrap graphics in place on a vehicle. The rubberized coating protects signs, films and wraps as well as vehicle paintwork from being marked or damaged. The extra long handle allows the Sign Gripper to be gently and carefully lifted to man oeuvre the sign/vinyl without causing damage when positioning delicate vinyl films. They can also be used for a variety of other applications including as coat hooks on Steel Partitioning and as a secure method of keeping papers in place on magnetic noticeboards by unscrewing the handle. Size: Diameter 43mm. handle Size : 65mm long . It offer strong magnetic force under the base . Multifuction: It can work as Vinyl Wraps Gripper Magnet Holder, Refrigerator Magnets ,Glass Magnets,Office Magnets,Board Magnets. Fluorescence Green : We offer this Green design that can help you recognize the magnets more easier , when you use it over the deep color flat , such as black car , black glass and so on . The fabric felt Magnet Site : You do not have to care about the Scratches after using , because the fabric Magnet felt Site can protect your car . It is fine and smooth Site . Convenient Use : Each package include 2 Magnet Holders that it is enough for you to use under any situation . 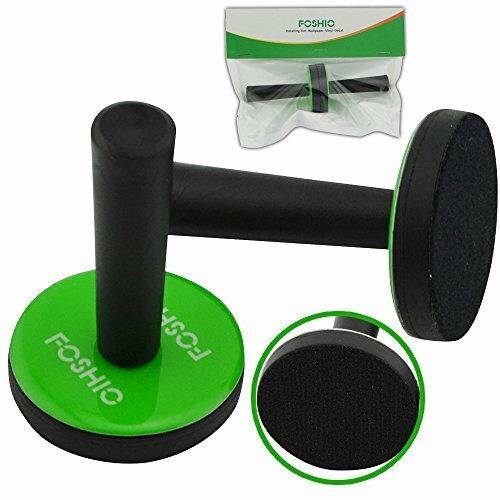 If you have any questions about this product by FOSHIO, contact us by completing and submitting the form below. If you are looking for a specif part number, please include it with your message.